Here's the one Copacetic customers have been ringing the phone off the hook about. And not without reason. 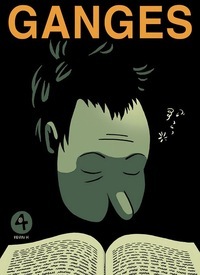 Each issue of Ganges has managed to make something new with the comics form. Huizenga pretty much picks up here where #3 left off – it may very well be the very same evening, diegetically speaking – and continues exploring the twilight zone of consciousness that lies between waking and sleeping, where memory and fantasy mix with all kinds of thought: this time around, from list-making to self-analysis to pondering the nature and meaning of being and time and space and... well, you get the idea. Ever the innovator, Huizenga has here incorporated the unique Ignatz format into the body of the work by making the extended French-flaps serve as a novel form of "infinity cover" – using them to create a "hall of mirrors" effect that provides the sense that the work continues ad infinitum in either direction, both forward and backward, in time and space. There are many major intellectual riffs being explored on these pages, which are more densely packed with ideas than any other comic book on the market. Foremost among them here is the compositional dynamic created by playing off the innate tension between the utopianism of the collecting/hoarding impulse and the harsh reality of mortality. This modulates seamlessly back and forth between rock solid ruminations on temporal scales – geological, historical and personal – and the human urge to collect and organize time itself in modular units. All of which folds back in on itself in dealing with the quandaries presented by memory storage and retrieval systems, both organic and technical. 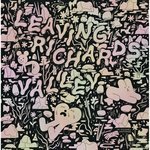 These are heady comics, but let there be no mistake, they are still comics, and a sense playfulness suffuses all: Huizenga is a master craftsman – all the aforementioned is made possible by the combination of his stone cold grasp of the fundamentals of the medium with his relentless explorative urge. In keeping with the comics tradition, there are many lighthearted asides, comical juxtapositions and flat-out fun cartooning interwoven through the main themes that provide many a mirthful moment. Notable are the various confusions and misconceptions that result from the semi-conscious state and, especially, the delicious yet not unfriendly skewering of the often overblown philosophizing of continental intellectuals of the 20th century, particularly Jean Paul Sartre and Martin Heidegger and their intellectual progeny - Jean Baudrillard and Jacques Derrida come to mind. A comic book to remember.